I’d be willing to bet that if there’s one thing we all can’t stand about the summer season, everyone would answer unanimously. It’s the bugs! They cause so much irritation and, otherwise unnecessary, inconvenience. Whether you simply try to avoid the outdoors in general, or remember to stop periodically to reapply your smelly spray, lotion, or whatever else you may have—we wouldn’t have to go to such great lengths if it wasn’t for the bugs. Well, what if I told you there was a different solution? Another way to protect yourself against the bugging and biting of parasitic insects in the summertime. A way that didn’t involve constant reapplication or tedious coverage of your exposed skin. I’m not just teasing you, here! This other solution actually exists! It’s called the Bug Patch from Foxworthy Outdoors and it’s amazing. No smell, no residue, no restrictions, no bugs! 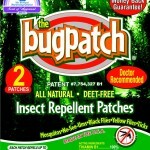 From ticks to mosquitoes to chiggers to gnats to black and yellow flies, the Bug Patch guarantees your protection from all of them for 24 hours using just one patch! The Patch works on a completely natural level. There’s no DEET or any other chemically-based activity happening underneath this natural insect repellent. Like other B vitamins, thiamin specifically, is excreted in perspiration. It also carries the scent that seems to be so appealing to those darn bugs! Cleverly, the Patch sends a uniform shipment of the vitamin B1 thiamin through your bloodstream. Then it is secreted through your pores as you sweat, masking the odor of carbon dioxide that the bugs seem to like so much. They won’t even notice that you’re there. There aren’t any locational restrictions when it comes to wearing the Patch. It won’t come off in a pool or in the shower! The Bug Patches have been awarded the National Parenting “Seal of Approval.” It’s 100% natural and recommended by doctors. Enjoy the summer without any sprays, lotions, or bugs!